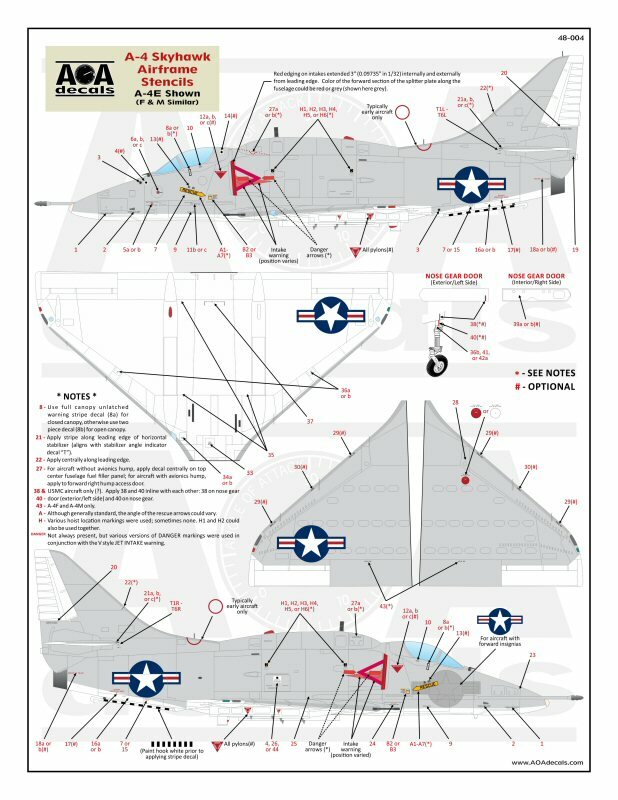 Contained inside a ziplock baggie is a sheet of high quality, high viz, full color stencils for the A-4 Skyhawk. With the Hasegawa and Hobbycraft kits on the market the need for quality decals cannot be overstated. These decals from AOA Decals are perfectly in register. Even though the one star and bars looks deformed it is perfectly correct. It is designed to fit over the inflight refueling boom. That is the attention to detail that you get with AOA Decals. The decals themselves are printed by Cartograf so you know they are the best in the world. They are thin and in perfect register with good color saturation. There are plenty of variations for some of the common stencils. So you'll have to check your references. 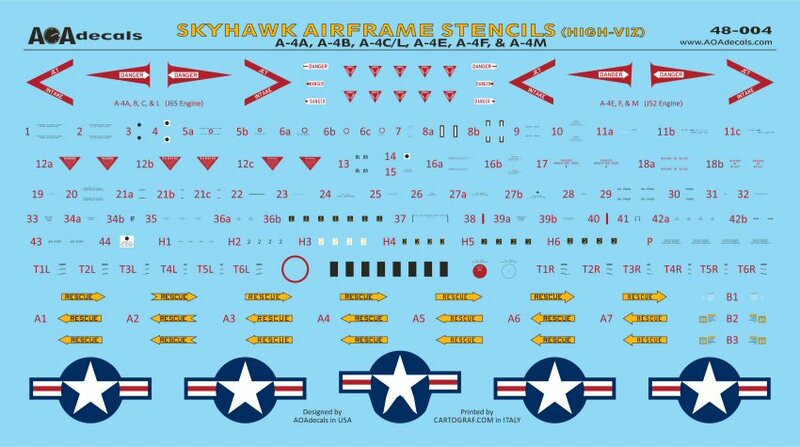 The sheet is about 5.5 x 9 inches and contains markings to do a single Skyhawk. 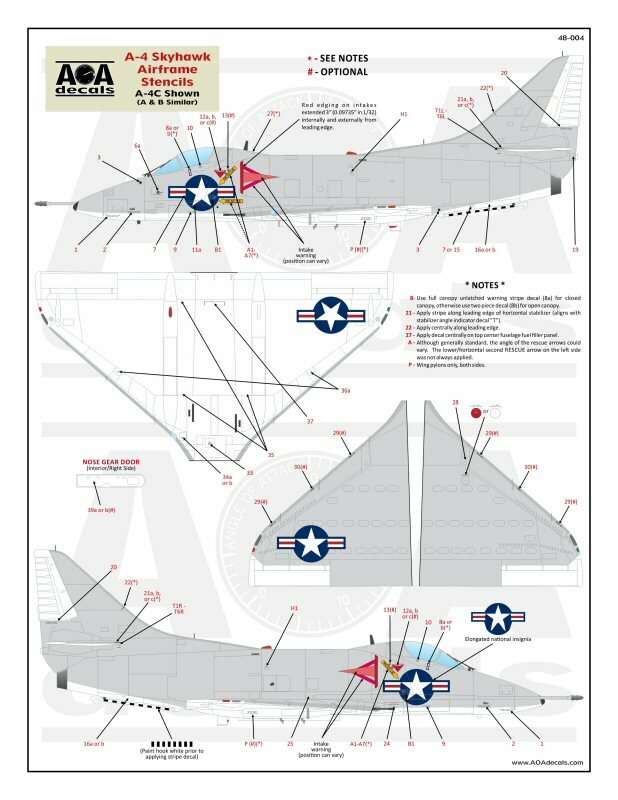 The decals are applicable to the early A-4A, B, C/L and E. They also cover the A-4F and M.
AOA decals keeps getting better and better. These decals are absolutely perfect for the diminutive Skyhawk. Printed by Cartograf and researched by AOA you can't get much better. Thanks to AOA Decals and IPMS/USA for the review copy. You can obtain yours directly from them at http://www.AOAdecals.com .